Love, love, love the BOB! I've been debating whether or not to order for the past 3 months or so and I am so happy I finally did it! (Thank you Albee for running the great promotion!) To note: You do not have to be a runner to love this. This stroller great for jogging but it's also really wonderful for uneven sidewalks, city walking etc. It's super easy to push and very importantly, a very smooth ride for baby! Super easy to use & set up. 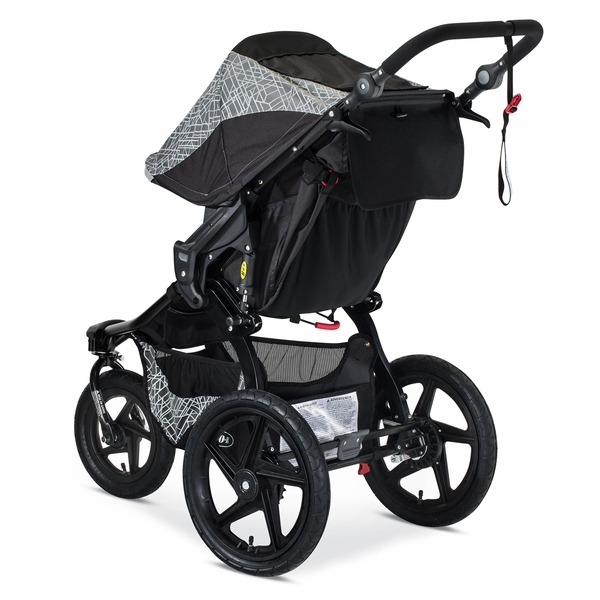 We are UPPAbaby Vista owners as well and I'm very happy to add this to the stroller lineup! ProsHuge sun shield, off road wheels, very smooth ride for baby. Best UsesSpeed walking, jogging and any uneven sidewalk terrain! 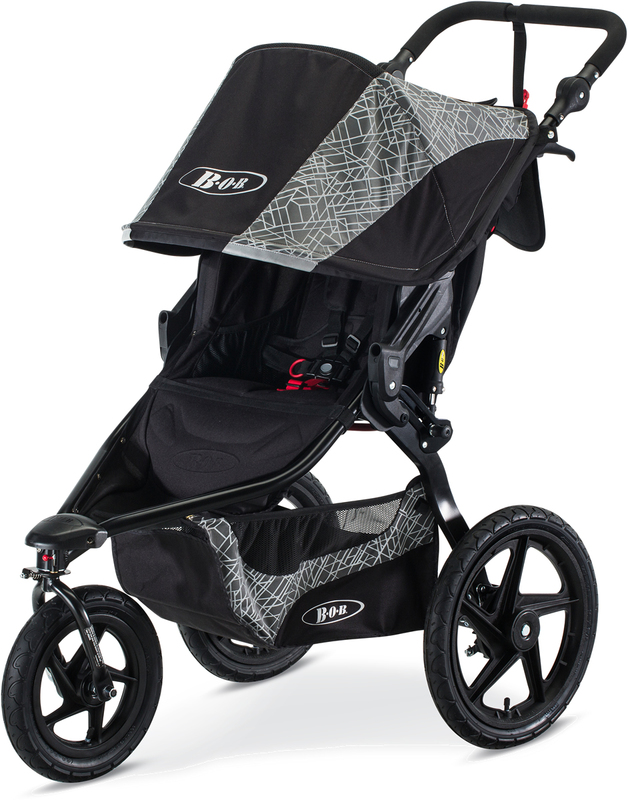 Perfect stroller for all your jogging needs! Came quick and was exactly what we expected at a great price! We love our Bob Revolution Flex Lunar. My little guy is just 8 months old and he loves riding in it. 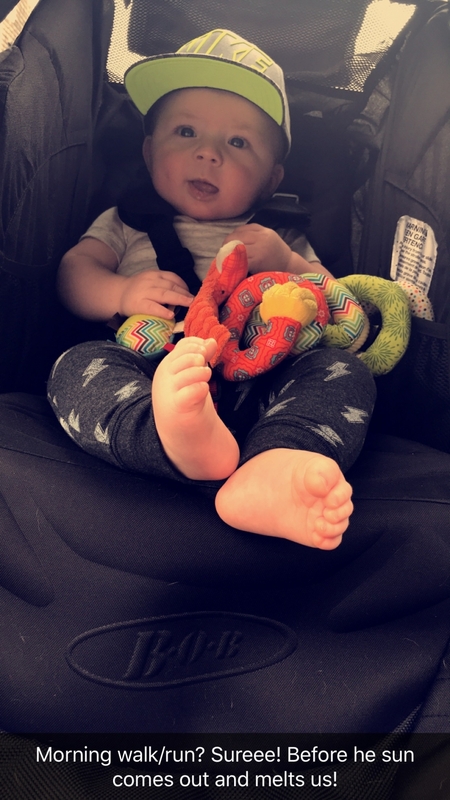 We've been using it since he came home with our Chicco infant seat with the adapter and it's been great. I love the shocks. They are a life saver when he is fussy and fighting sleep. I can bounce the stroller just a little and he is asleep in no time. We've recently put him in with out the carrier and he loves sitting up seeing the world. When I had my first son -he's 8 now, but with him we bought an inexpensive jog stroller and now I wish we had spent the money on a Bob for him. Wheels are BIG but reflection is great! This is the 3rd BOB stroller I have had over 9 years. not because they break but because I keep upgrading to newer and better. I like this most recent purchase because of the reflecting fabric on the hood/cover. The basket is perfect size for farmer's markets and general errand running. This is not a stroller I throw in my car. I keep it open and ready in my garage for walks and runs (incl local farmer's markets.) Wheels are quite big but since I don't travel with this stroller it doesn't matter to me at all. Great quality and design. My wife and I chose this stroller because we live in a gravel/dirt road community. This stroller is awesome. It make walking/hiking a breeze. With optional adapter we can snap our Britax seat right in. Also got a great price from Albeebaby.com so this purchase was a win-win. 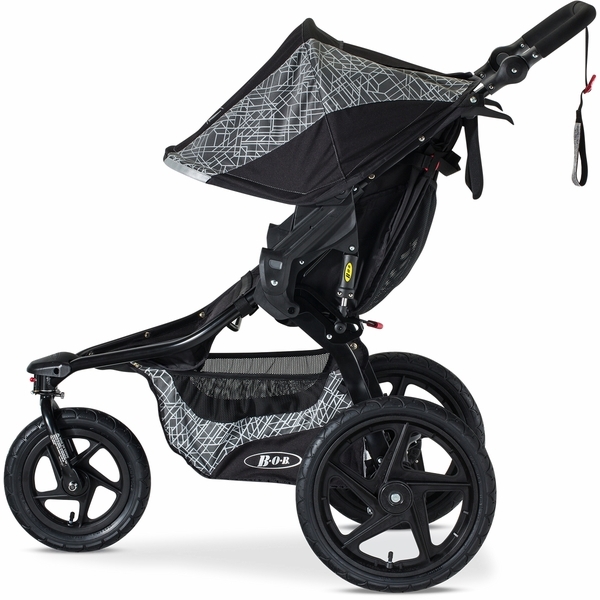 I workout with FIT4MOM and was in desperate need of a true jogging stroller my litrle one loved! Love and first sight. My daughter actually gets super excited to get in the stroller and falls asleep! NEVER HAPPENED in my other stroller. The push is amazing for ALL terrain as I workout on grass, gravel and curvy paths. The suspension is great and my little one is not bothered at all. This jogging stroller is great for all terrain territory. It glides so smooth on pavement and I love that it reflects for early morning or later walks/runs. I would highly suggest getting a bob itâ€™s worth the extra money. ProsEasy to fold. Easy to push. Reflects all light. Breathable for Baby. I wanted a BOB initially but was gifted with a different stroller. I waited until my son was 2.5 before getting this stroller. I wish I had changed sooner! This stroller has made it through numerous hikes on uneven terrain, many 5ks, and of courses walks. Whereas my previous stroller needed constant adjustments after hiking, the BOB does not. The glow feature makes me feel more visible in the evenings. My only disappointment is at 3.5 my son is very tall. At some point soon, the shade will not fit over his head. I'm hoping I can continue pushing until he reaches 4. Best jogging stroller I have had yet! Very smooth and my baby loves to go on walks in it. She gets so excited! Love the Lunar Bob Jogger! Got it a few weeks ago. I was overwhelmed with the thought of assembling it but it wasnt hard at all to put together. I also like how the pattern on the stroller is different from the rest. The reflection on it is bright and great for night walks/jogs! Runs smooth too! Attractive Pattern and all the classic likes of a BOB!! The Lunar pattern is very appealing as well as functional. 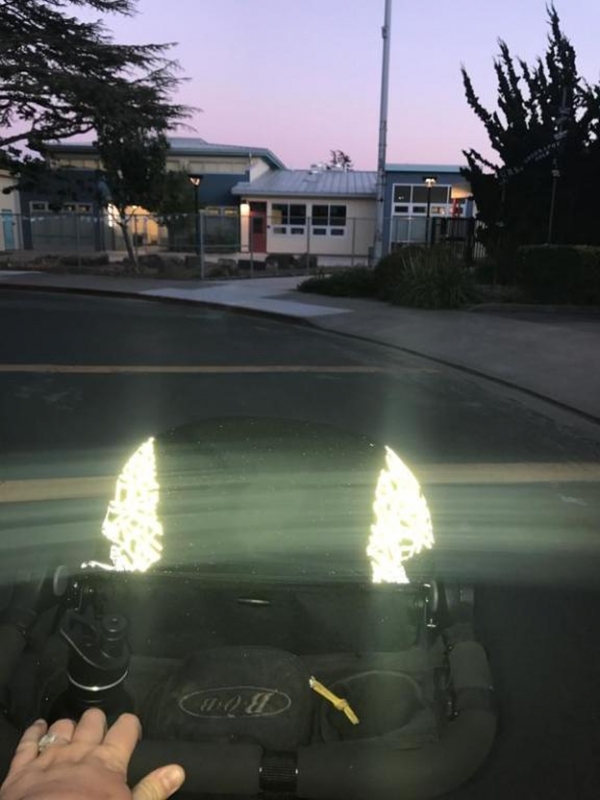 The revolution Flex expected performance is there, while giving a safer ride for the little one with the reflective material. This stroller has been a game changer for my family! We are super active and our old stroller just wasn't cutting it. The Bob is amazing for our trail walks, workouts and even just walks around our neighborhood. Its so sturdy, easy to fold up and not too heavy to get into my car. My husband is a mountain biker and he couldn't believe how well built it was - he said it reminded him of his mountain bike! My son (8 months old) LOVES it! Its comfortable for him, and he loves laying back and looking up through the window on the top. It also has great little pockets on the inside of the seat where I put some toys for him. The lunar reflective material is great - even though we have only really used it for walks at dusk around our neighborhood, it makes us feel much safer. I love the big storage area underneath and that you can adjust the handle bar to the perfect height. I highly recommend this stroller! *I am partnering with B.O.B. Gear for the review of the BOB Revolution FLEX stroller in the Lunar fashion. I received a product in exchange for my review and honest opinion. This stroller has been a game changer for my family! We are super active and our old stroller just wasn't cutting it. The Bob is amazing for our trail walks, workouts and even just walks around our neighborhood. Its so sturdy, easy to fold up and not too heavy to get into my car. My husband is a mountain biker and he couldn't believe how well built it was - he said it reminded him of his mountain bike! My son (8 months old) LOVES it! Its comfortable for him, and he loves laying back and looking up through the window on the top. It also has great little pockets on the inside of the seat where I put some toys for him. The lunar reflective material is great - even though we have only really used it for walks at dusk around our neighborhood, it makes us feel much safer. I love the big storage area underneath and that you can adjust the handle bar to the perfect height. I highly recommend this stroller! *I am partnering with B.O.B. 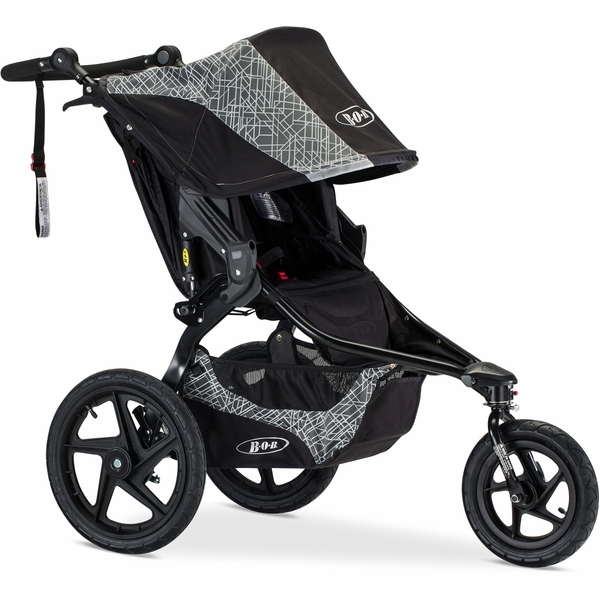 Gear for the review of the BOB Revolution FLEX stroller in the Lunar fashion. I received a product in exchange for my review and honest opinion. There are SO many awesome things about this stroller, but I will just hit the highlights! The features are one of a kind, adjustable handlebar, reflective fabric, modern design, cushion seating for your babe.. I could go on but this are a few of my favorites! 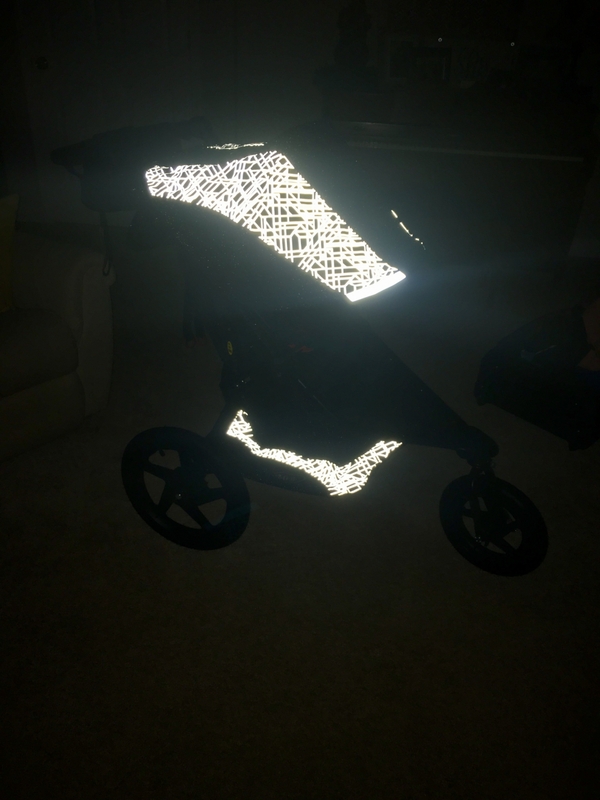 The reflective fabric is such a great safety feature, we have been at friend's houses and walked home when it started getting dark and the reflective lighting was a comfort for this mama! My little babe has had no complaints, the cushion seating and quick adjustable recline have her riding in style, and sometimes napping! My personal favorite things about the stroller is how smooth it rides and the durability. I know this will be my go to jogger stroller for years and babes to come! I would (and have) recommended this stroller to friends, in my opinion it's the best on the market. I received the stroller as a gift from the company, but the opinions are completely my own. I've been using the Bob Revolution Flex with my newborn and love it. I can go on any terrain. It is smooth and easy to use. The newborn car seat fits perfectly and I love how I can get full coverage to protect baby from the sun. The peek a boo feature allows me to cover him from the sun but still see how he's doing. It's perfect! I never thought I would be the mom to have multiple strollers... all my fellow mom friends insisted that their BOB was the best thing ever. Finally, I realized being a working mom, that it was really hard to get in my workouts.... and when I did make time, who would watch the baby??? So I thought, if I start running again and get a BOB, I can bring the baby with me. I finally bit the bullet & made the purchase! Albee had a great promo and had the newest limited edition BOB stroller, so it was a no brainer! Now I get what all the hype is about!!! It rides sooooooo smooth!!!! My babies loves it!!!! I love it! My husband loves it! Best purchase ever. My everyday stroller is the Uppa Cruz... and we find ourselves using our BOB more than the Uppa! Best UsesRunning/active. It's def a specialty stroller. 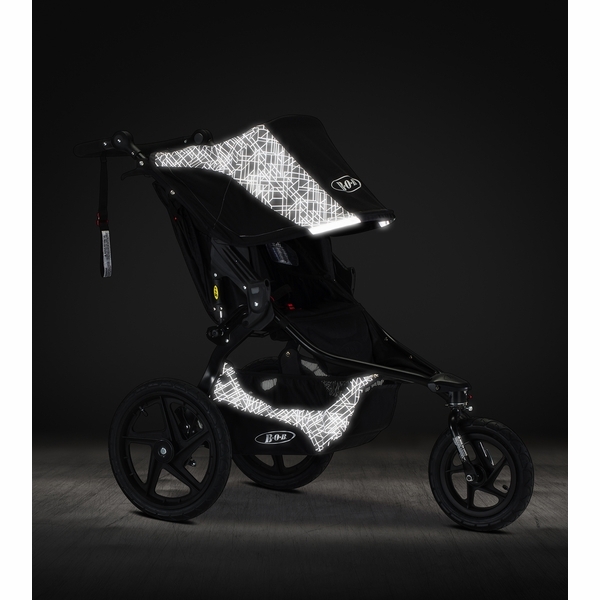 This is an awesome stroller and I am glad that I waited to get the new lunar model with the reflective pattern. The reflective details make it really stand out in all light. 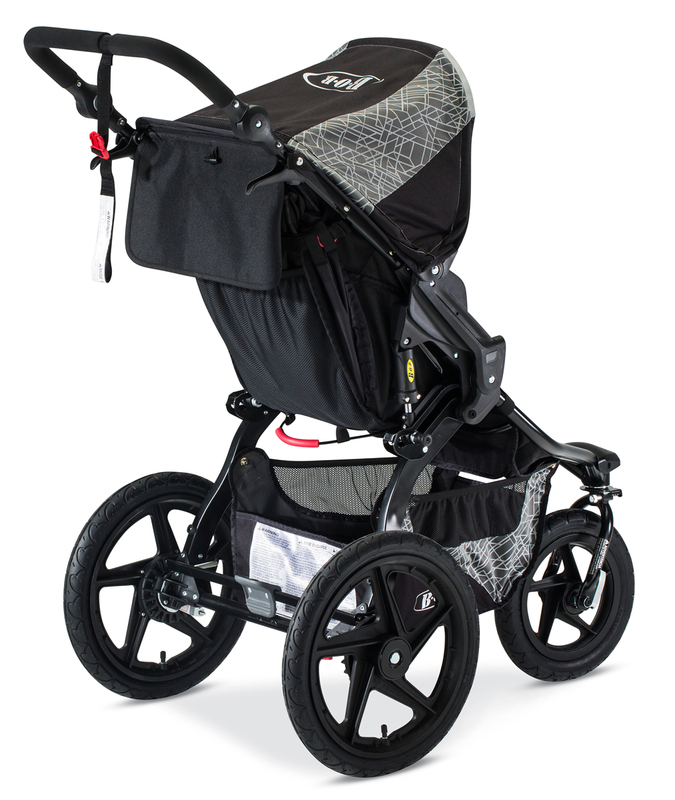 Functionally, the stroller is amazing to maneuver with great shocks. Worth the money. Best stroller EVER! As soon as I started running I had to get a BOB. I purchased a used 2012 Revolution SE and loved It! It being an older model the snack tray was hard for my daughter to reach though...so that was my excuse to buy a new one ;) So many great improvements! The shocks are incredible. It reclines up and down so easily, and the reflective part is awesome, bigger basket, sits up higher, all black! so when she gets food all over the seat you can barely tell. 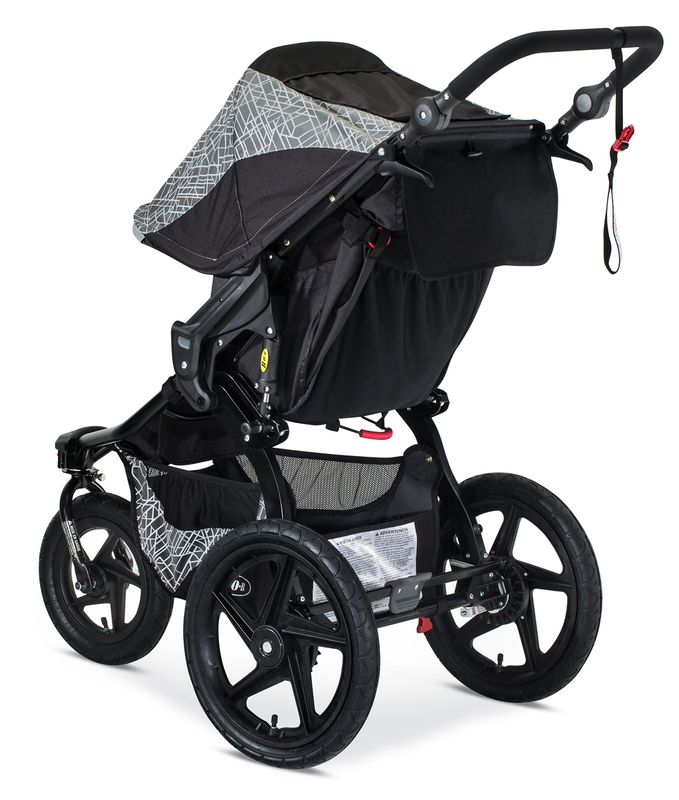 I do Stroller Strides five days a week too and this stroller is just perfect! 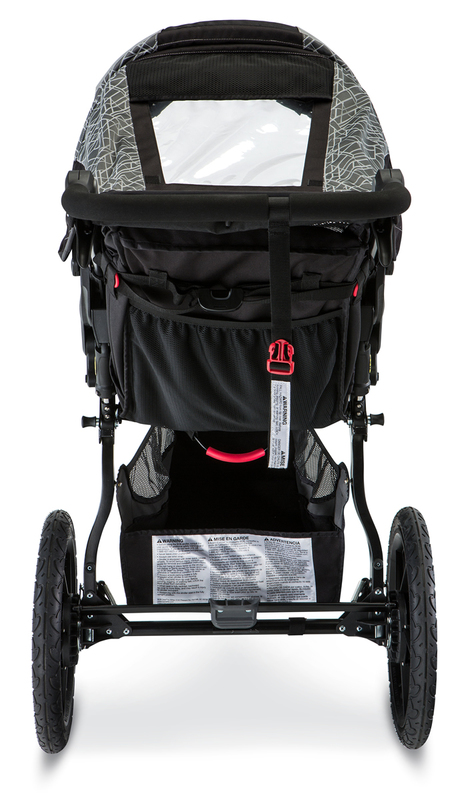 We love this stroller, it rolls much smoother than our Baby Jogger Premier. We like the flexing handlebar. I do worry that the reflective material may peel over time after being folded back and forth on the sun cover. We will see over time. Preordered this stroller to replace a bob I had purchased off of Craigslist. I run 4-5 times a week and wanted an upgrade (the other has a few minor issues and I could not get a tray because it is so old). I love this stroller. It's a must for runners and my daughter does great in it. Company sent the stroller out just as soon as it became available, very happy. I've been running with a stroller with all three of my littles for the majority of the past seven years and it is nice to see a stroller company start to put safety first. I feel like the reflective features make this a must-have stroller. Even if you aren't and evening or early morning runner the added visibility during the daytime is a great safety feature. This is my third BOB, I received the single for my baby shower years ago with my first and also had the BOB Duallie as well. 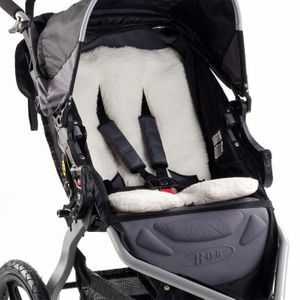 The details on the stroller are really well thought out, and as with all BOB products I've owned the quality is high. The one feature that could be improved is a single-step fold, but the two step fold isn't a deal breaker. 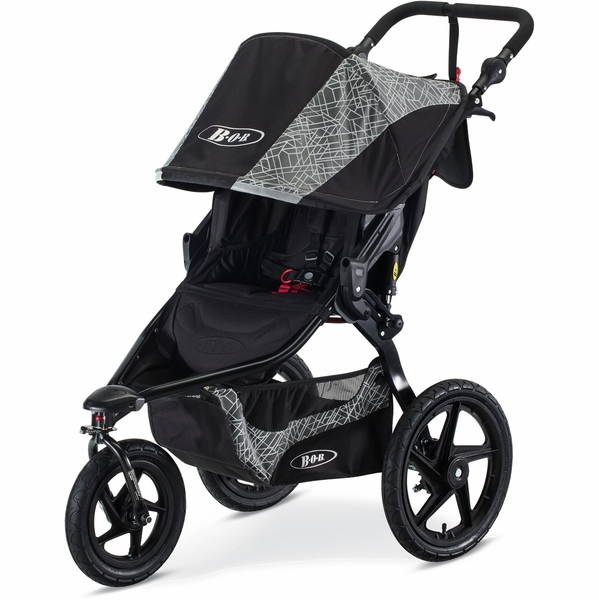 Overall, I would highly recommend this stroller as a great running and all around stroller. 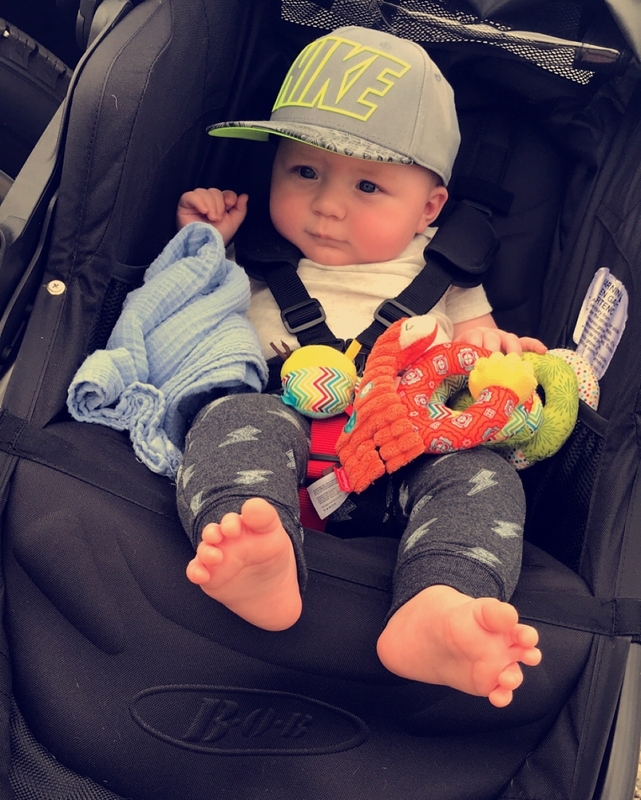 I received this stroller as a gift from the company, but the views expressed here are my own. I upgraded to this stroller from the BOB Revolution SE. 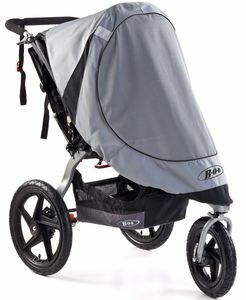 It has all the features I love about BOB strollers in general, plus some great upgrades. The new reflective fabric is an obvious change. I was impressed with how brightly it reflected during twilight runs (and even with a flash in the daytime). I also love the adjustable handlebar, deeper basket under the carriage, and the larger plastic foot pedal on the break (the old metal one used to hurt my foot). There are two additional pockets on the back of the seat, which provide easy access for kid snacks. Plus, there is great airflow through the carriage for my kid. It also folds up quite small for transport and the back wheels are easier to remove and snap securely into place. I absolutely love this stroller and it's smooth ride. Today was my first real spin in the Lunar. My husband took the boys in our Duallie and I took our daughter on 5 x1K runs. It ran so smooth! Honestly, I usually don't lock the front wheel because I just love the swivel, but I know it's safer when running so I locked it today, and it handled the turns with ease. This is what dreams are made of! The swivel in walking mode is just unrivaled--even my husband noticed a difference when we moved from a different jogger to the BOB Duallie. I remember him saying, "I can hold my coffee and push this stroller at the same time." It's the little things, you know? Some of our favorite features of the BOB Lunar are the adjustable handlebar (perfect for a couple who is 5' and 6'--we both can run with good form, keeping our wrists in a neutral position), the bigger cargo storage, the ease to which the seat can adjust (I can even raise or lower my child while on the run and wearing the safety steal), and of course, the reflective canopy and basket! It's amazingly reflective and very pretty in normal daylight. I was so lucky to get to partner with B.O.B. Gear for the review of the BOB Revolution FLEX stroller in the Lunar fashion. I received a product in exchange for my review and honest opinion. These thoughts are entirely my own. BOB Lunar review Today was my first real spin in the Lunar. My husband took the boys in our Duallie and I took our daughter on 5 x1K runs. It ran so smooth! Honestly, I usually don't lock the front wheel because I just love the swivel, but I know it's safer when running so I locked it today, and it handled the turns with ease. This is what dreams are made of! The swivel in walking mode is just unrivaled--even my husband noticed a difference when we moved from a different jogger to the BOB Duallie. I remember him saying, "I can hold my coffee and push this stroller at the same time." It's the little things, you know?Some of our favorite features of the BOB Lunar are the adjustable handlebar (perfect for a couple who is 5' and 6'--we both can run with good form, keeping our wrists in a neutral position), the bigger cargo storage, the ease to which the seat can adjust (I can even raise or lower my child while on the run and wearing the safety steal), and of course, the reflective canopy and basket! It's amazingly reflective and very pretty in normal daylight.I was so lucky to get to partner with B.O.B. 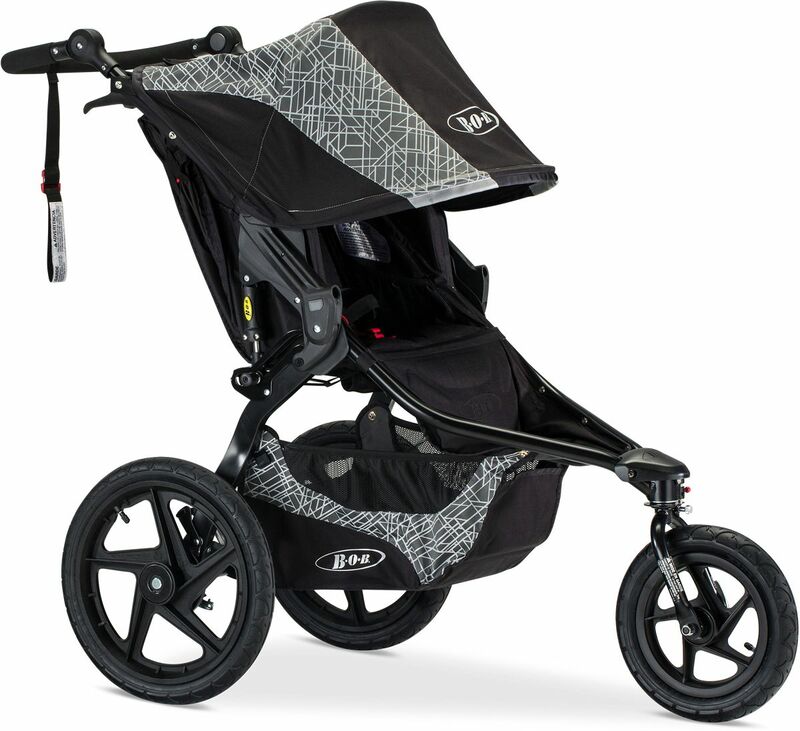 Gear for the review of the BOB Revolution FLEX stroller in the Lunar fashion. I received a product in exchange for my review and honest opinion. These thoughts are entirely my own. Super smooth ride. Great for evening runs. I love this stroller! 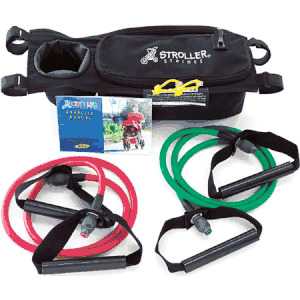 It's my first BOB jogging stroller and it's head and shoulders above my previous jogging stroller which was from another brand.First let's start off with the handle bars. You can adjust them in several positions which is so great when you're running for long periods and need to make adjustments. 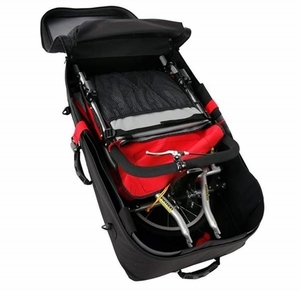 I also love that it's padded because it makes pushing the stroller much more comfortable. The padding is also great for sweaty palms which I'm a victim of on hot summer training runs.Next is the easy folding process. It literally collapses in seconds with ease and fits into my full size car trunk. This was a huge plus for me. 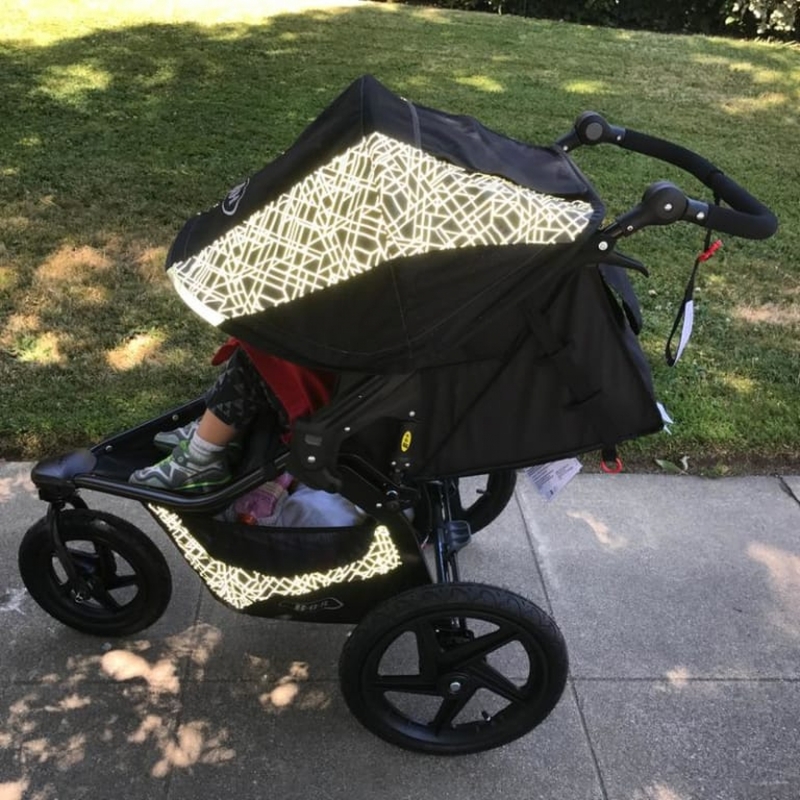 I actually got caught in a rainstorm when I went running recently and being able to quickly fold and stow the stroller was a Godsend.My favorite feature is of course the Lunar reflective fabric. A lot of my training runs takes place in the evening and being able to be seen when you're pushing 50+ lbs at a decent pace is important for safety. I used to rush to get my stroller workouts in before it got dark but now I don't have to.Now onto the ride. It's smooth. I've pushed this thing on asphalt, wood bridges, concrete, dirt and grass and it's handled extremely well. My baby barely moves when she's in the stroller. She's also able to drink her bottle with ease while I run.Baby's Comfort:I love the padded seat and harness along with side pockets that I use to stash toys and bibs. I can also easily recline the seat with one hand. My baby is completely content in this thing to the point where I think she's asleep but she's not.I also love the extra large canopy. It shields her from the sun and wind. That's a major issue I had with my last stroller that this one has solved.I know this review is long but I wanted to provide as much detail as possible in hopes that I answer a lot of concerns that I know I had when I was searching for a jogging stroller. I definitely recommend this stroller. *This stroller was gifted to me by the company but the views are all my own. 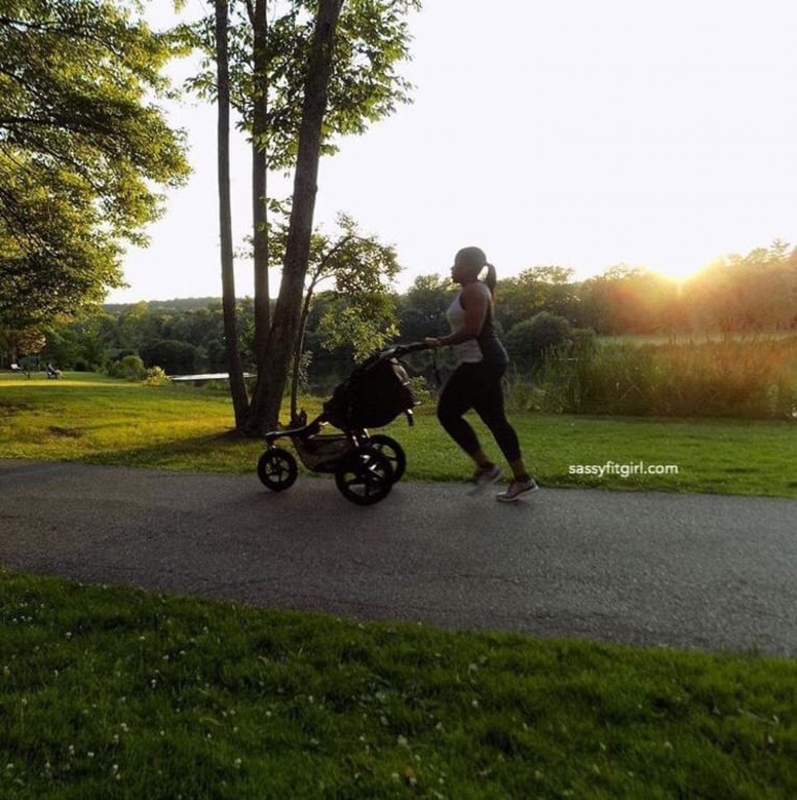 As a busy mom of 4, stroller running is the only way I can get any workout in during the day and often my stroller running has to happen during dusk hours. The new BOB Lunar stroller with its reflective siding is perfect! I own one other BOB stroller, a duallie and other brands too. I have had to equip them with reflective bracelets and blinking lights yet still not enough when running in the evening. 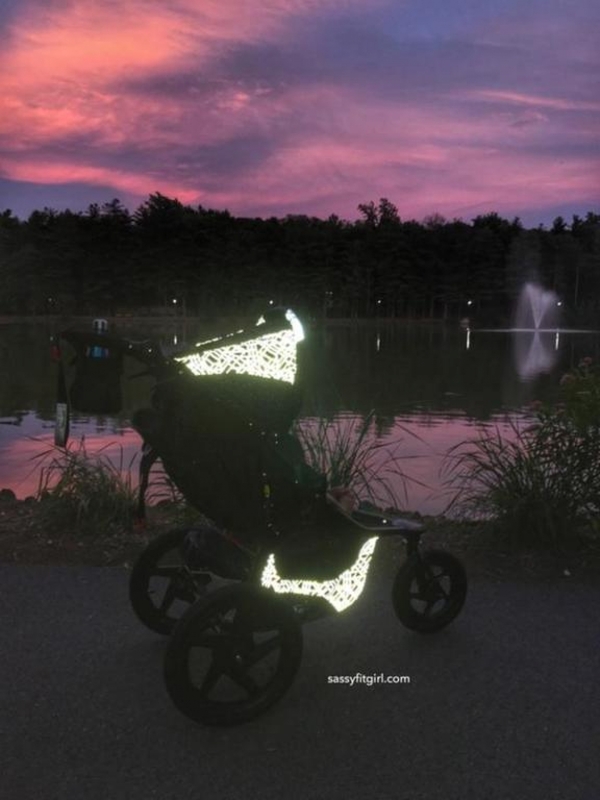 This stroller has just the right amount of reflectivity in all the right places. Top and bottom which is perfect to catch the eyes of drivers and bicyclists. The canopy and the basket are just the right spots to make sure we are seen when headlights/bike lights hit the stroller. My stroller rider has special needs with health issues. At first I was unsure if he would like the stroller, but he loved it from the first run. It has multiple reclining positions to help with his challenges, a large underseat basket to store all necessary accessories and a large canopy that provides great coverage in the warm sun but he can still have sight line access to the street. Yet the biggest asset of this stroller is the reflectivity! As I look ahead into winter running, I plan on purchasing the rain cover. I hope there is one available that does NOT hide the reflectivity in the hood. Having that aspect of this stroller has helped ease my mind a little when I run. Overall, I highly recommend this stroller. 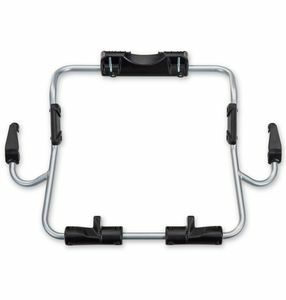 Easy to use straight from the box, sleek design with the all black frame and running with the fixed wheel is a breeze with the adjustable handle positioning. DISCLAIMER: In collaboration with BOB Gear, I recieved the Revolution Lunar Flex in exchange for my review and honest opinion. All opinions expressed above are based upon my experience with the stroller and completely my own. As a busy mom of 4, stroller running is the only way I can get any workout in during the day and often my stroller running has to happen during dusk hours. 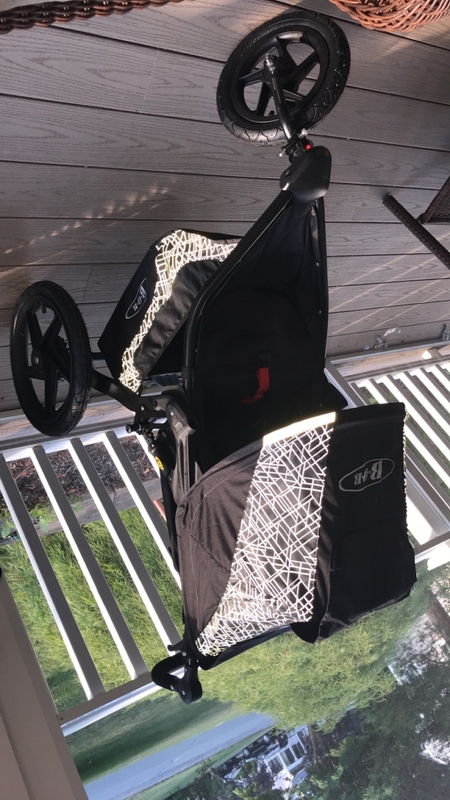 The new BOB Lunar stroller with its reflective siding is perfect! I own one other BOB stroller, a duallie and other brands too. I have had to equip them with reflective bracelets and blinking lights yet still not enough when running in the evening. 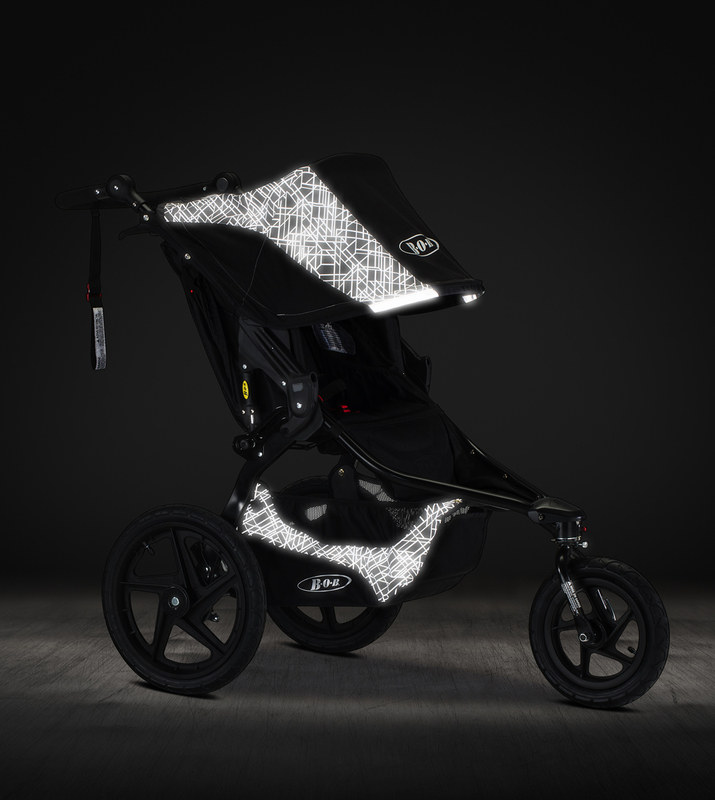 This stroller has just the right amount of reflectivity in all the right places. Top and bottom which is perfect to catch the eyes of drivers and bicyclists. The canopy and the basket are just the right spots to make sure we are seen when headlights/bike lights hit the stroller. My stroller rider has special needs with health issues. At first I was unsure if he would like the stroller, but he loved it from the first run. It has multiple reclining positions to help with his challenges, a large underseat basket to store all necessary accessories and a large canopy that provides great coverage in the warm sun but he can still have sight line access to the street. 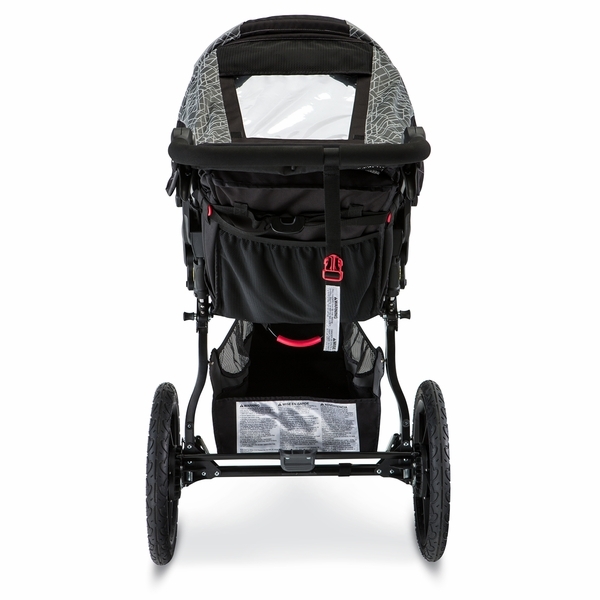 Yet the biggest asset of this stroller is the reflectivity! As I look ahead into winter running, I plan on purchasing the rain cover. I hope there is one available that does NOT hide the reflectivity in the hood. Having that aspect of this stroller has helped ease my mind a little when I run. Overall, I highly recommend this stroller. 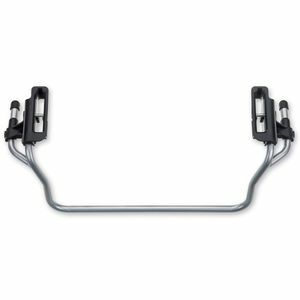 Easy to use straight from the box, sleek design with the all black frame and running with the fixed wheel is a breeze with the adjustable handle positioning. DISCLAIMER: In collaboration with BOB Gear, I recieved the Revolution Lunar Flex in exchange for my review and honest opinion. All opinions expressed above are based upon my experience with the stroller and completely my own. I love this stroller! It's my first BOB jogging stroller and it's head and shoulders above my previous jogging stroller which was from another brand. First lets start off with the handle bars. You can adjust them in several positions which is so great when you're running for long periods and need to make adjustments. I also love that it's padded because it makes pushing the stroller much more comfortable. The padding is also great for sweaty palms which I'm a victim of on hot summer training runs. Next is the easy folding process. It literally collapses in seconds with ease and fits into my full size car trunk. This was a huge plus for me. 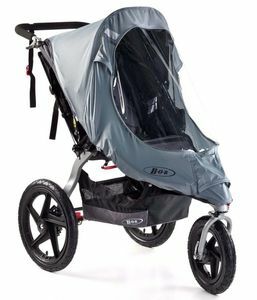 I actually got caught in a rainstorm when I went running recently and being able to quickly fold and stow the stroller was a Godsend. My favorite feature is of course the Lunar reflective fabric. A lot of my training runs takes place in the evening and being able to be seen when you're pushing 50+ lbs at a decent pace is important for safety. I used to rush to get my stroller workouts in before it got dark but now I don't have to. Now onto the ride. It's smooth. I've pushed this thing on asphalt, wood bridges, concrete, dirt and grass and it's handled extremely well. My baby barely moves when she's in the stroller. She's also able to drink her bottle with ease while I run. 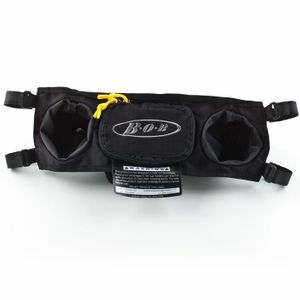 I love the padded seat and harness along with side pockets that I use to stash toys and bibs. I can also easily recline the seat with one hand. My baby is completely content in this thing to the point where I think she's asleep but she's not. I also love the extra large canopy. It shields her from the sun and wind. That's a major issue I had with my last stroller that this one has solved. 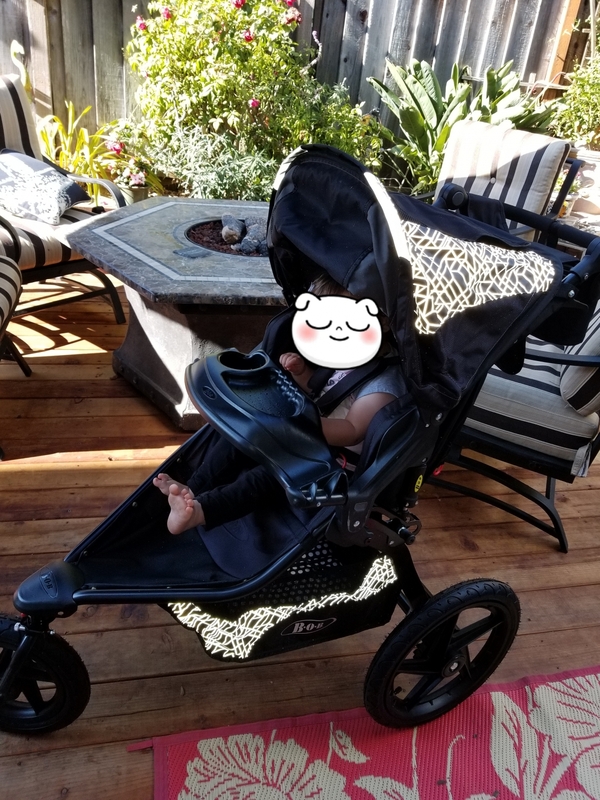 I know this review is long but I wanted to provide as much detail as possible in hopes that I answer a lot of concerns that I know I had when I was searching for a jogging stroller. I definitely recommend this stroller. *This stroller was gifted to me by the company but the views are all my own. This is the Bob to Invest in! This is a GREAT STROLLER! 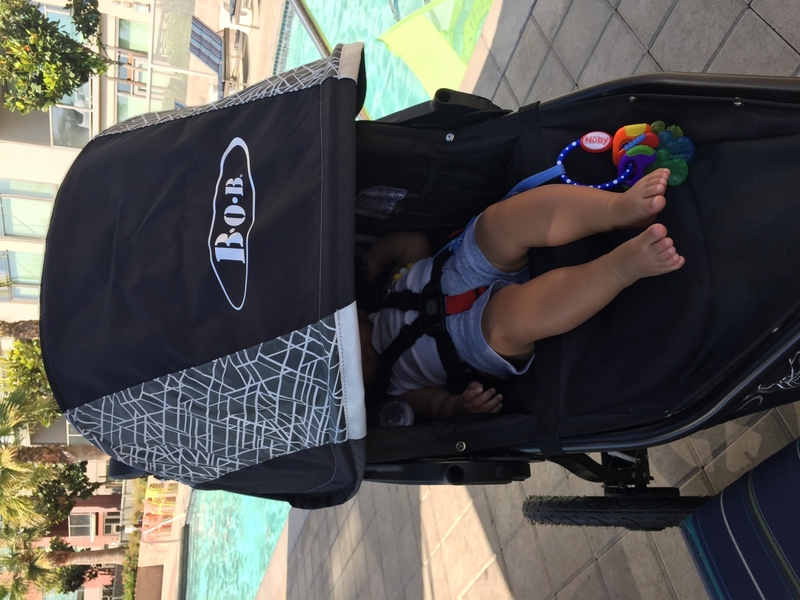 I have an older Bob Revolution that is WELL loved, but I've been using the Flex Lunar stroller for about a month now. I wanted to share my experience on the eve of my first race with the stroller. Type of Use: I have been using the stroller for around town and for training on a variety of surfaces - street and trail; with a 35lb preschooler in tow. 1. 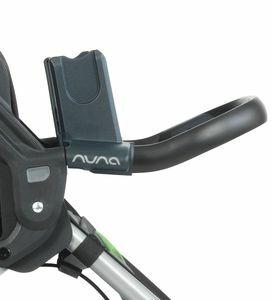 Adjustable Handle Bar! I couldn't decide if this, or the reflective fabric was my favorite feature...they're close, but having the option to adjust the handle bar for wrist comfort is SO nice. Even my preschooler can hold on a push, there are varying levels for any height. 2. Reflective Fabric is huge for us too, since we do much of our exercise before or after work most days. We can now get around and be seen - I felt really safe running at dusk. These are the features that stood out for me, but it also has everything you'd come to expect from a BOB stroller; awesome handling, sturdy fabric/frame, and now super stylish design. 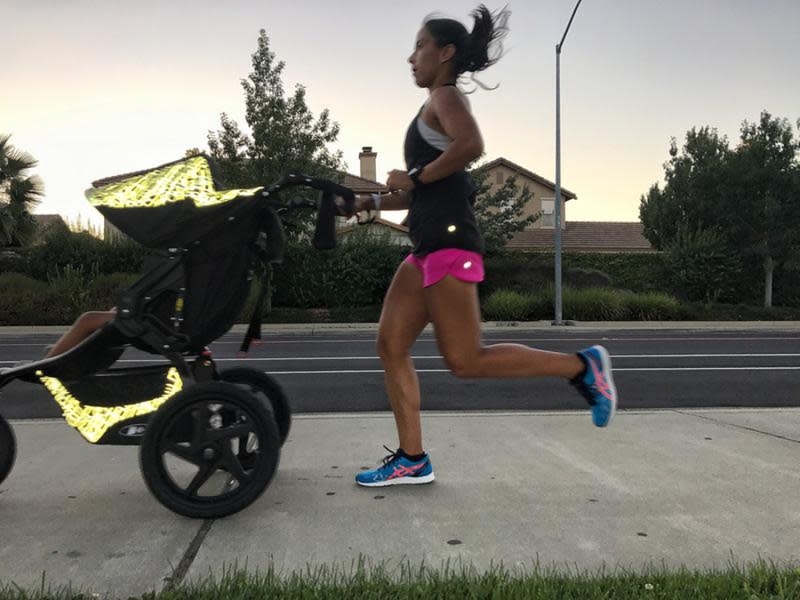 I'd highly recommend this stroller for anyone looking to get back into running, serious runners needing to train with littles ones, or even as a day to day stroller that's super comfortable for both parents and kids and it's a day to night stroller! *I was lucky enough to receive the stroller as a gift from the company, but these opinions are completely my own. This is a GREAT STROLLER! 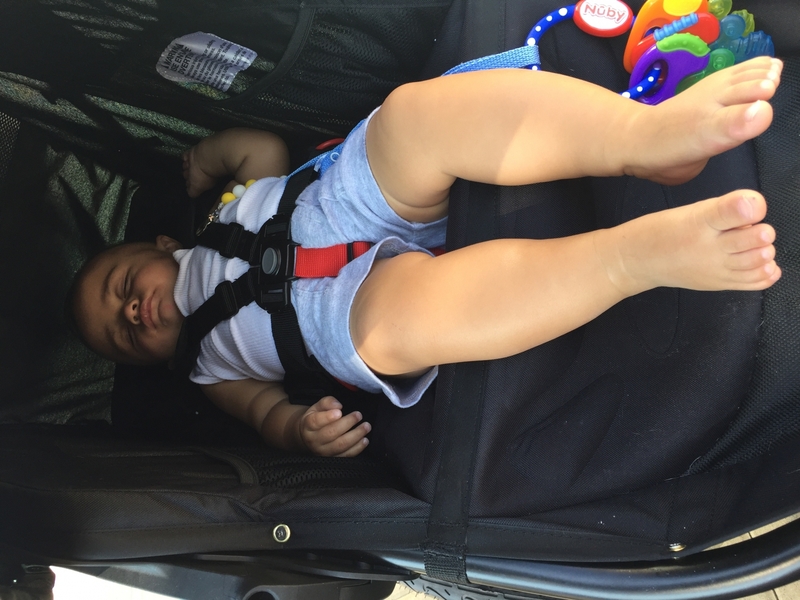 I have an older Bob Revolution that is WELL loved, but I've been using the Flex Lunar stroller for about a month now. I wanted to share my experience on the eve of my first race with the stroller. Type of Use: I have been using the stroller for around town and for training on a variety of surfaces - street and trail; with a 35lb preschooler in tow.1. Adjustable Handle Bar! I couldn't decide if this, or the reflective fabric was my favorite feature...they're close, but having the option to adjust the handle bar for wrist comfort is SO nice. Even my preschooler can hold on a push, there are varying levels for any height.2. Reflective Fabric is huge for us too, since we do much of our exercise before or after work most days. We can now get around and be seen - I felt really safe running at dusk.3. One handed recline! Literally pinch the clasp and your sleepy little one can be in a reclined position in about 2 seconds, my little one really liked how comfy the seat is too. :)These are the features that stood out for me, but it also has everything you'd come to expect from a BOB stroller; awesome handling, sturdy fabric/frame, and now super stylish design. 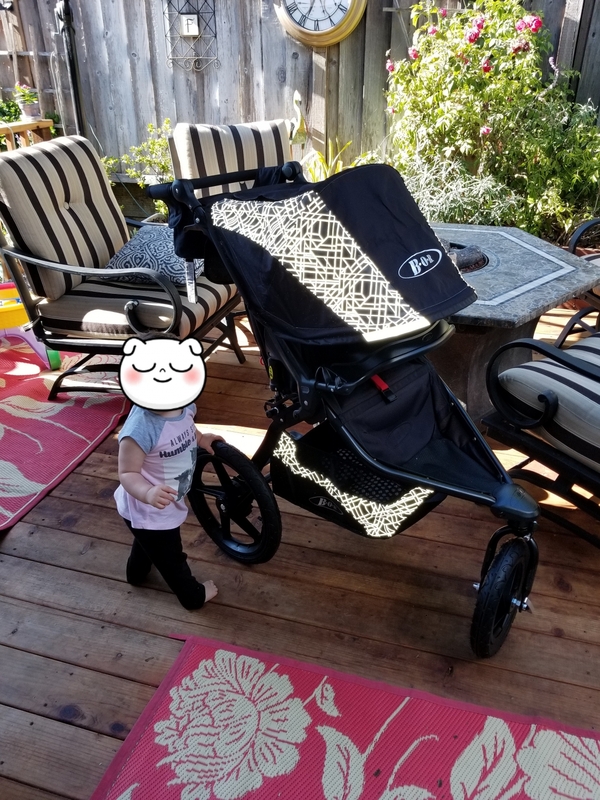 I'd highly recommend this stroller for anyone looking to get back into running, serious runners needing to train with littles ones, or even as a day to day stroller that's super comfortable for both parents and kids and it's a day to night stroller! *I was lucky enough to receive the stroller as a gift from the company, but these opinions are completely my own. 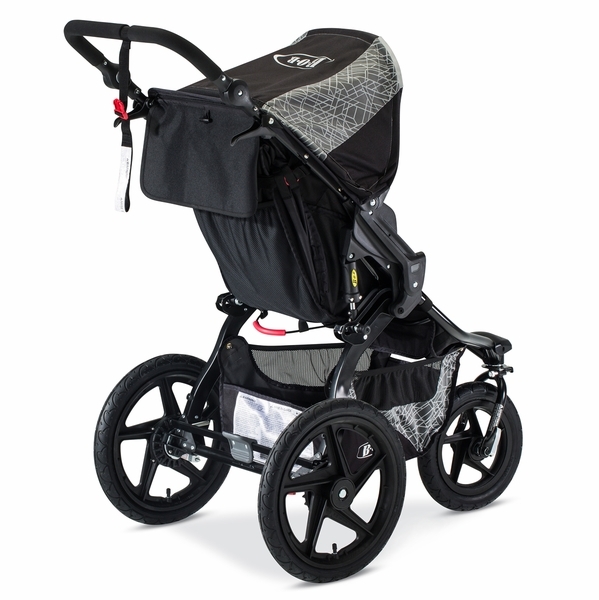 Reflect your passion with the Revolutionï¿½ FLEX Lunar jogging stroller. The ultra-reflective fabric keeps you visible during morning runs or evening strolls, making it easy to fit family outings into your busy schedule. This stroller is both vibrant and versatile.The front wheel can swivel for easy maneuverability or lock for added stability. 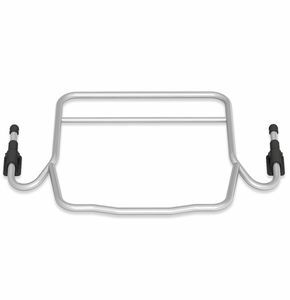 The handlebar adjusts to 9 positions, offering the perfect fit for parents of different heights. A state-of-the-art adjustable suspension system takes bumps in strideï¿½so boardwalks, beaches and trails are no match for the Revolution FLEX Lunar. Your child will love the fully upright seat, which can be easily adjusted with one hand to find the perfect seat angle. And the extra-large cargo basket, easy fold and travel system compatibility make the Revolution FLEX Lunar a true fan favorite. Stay safe and be seen on all your adventures with the ultra-reflective BOB Revolution FLEX lunar. BOB, the #1 jogging stroller. 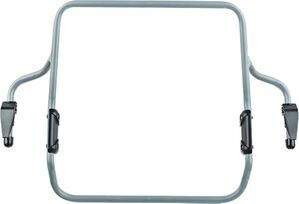 Extra-large Low Boy Cargo Basket provides 15% more storage space so you can take everything you need when youï¿½re on the go.